Browse » Home » Umum » Freebie Sites believe or not? Freebie Sites believe or not? Freebie Sites believe or not? Some friend ask me about that, because I reffer him to join some freebies site Xpango.com. He ask how come this site give us expensive gadget for free like Ipod, X-box or some cell phone. Than I go to ask google, maybe I found something there about how freebie site work. First that freebies that i know is xpango, so I search with that keyword maybe i can find something used. But there only many advertise sites about xpango that give us refferal ID. Theres said that Xpango is one of the many of these ‘freebie sites’ available, and definitely one of the best and most reliable, so dont worried to join there. For how to join there, I was post last time in Indonesian lang here. Here I explain where do for sign up, what we get, how they make money and how they do it? Its easy for sign up, just go to this link and choose what kind of gadget you like. Theres many kind of new gadget, after that complete the form and dont forget to enter 91691415 be your refferal ID. 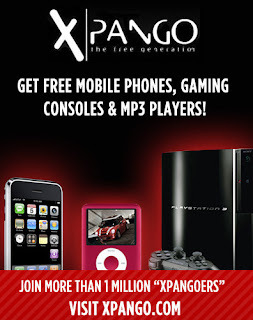 For join xpango we can get gift that we choose before, its all free until your home. Its come possible freebie sites, cause they have income for something that you do before you get your gift for free. How come they can give you free stuff? Freebies Industry is actually a huge business sites like Getrewardz are huge companies and have sent over 1 million dollars of Freebies away, but the reality they make money too.